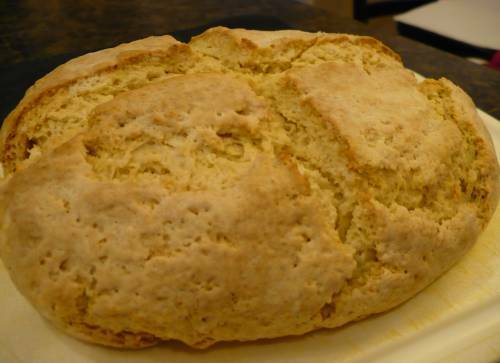 Baking a loaf of Irish Soda Bread is total culinary therapy! The smell of fresh bread baking and the texture of that first bite are heavenly. This recipe is a great way to teach kids about their Irish heritage and their ancestors, while also teaching them the art of breadmaking. If you like raisins or caraway seeds in your Soda Bread add them to the dough along with the buttermilk. In a large bowl, mix together flour, sugar, baking soda, baking powder, salt and margarine. Stir in 1 cup of buttermilk and egg. Turn dough out onto a lightly floured surface and knead lightly. Form dough into a round and place on prepared baking sheet. In a small bowl, combine melted butter with 1/4 cup buttermilk and brush lightly onto loaf. Use a sharp knife to cut an 'X' into the top of the loaf. Bake in preheated oven for 45 to 50 minutes, or until a toothpick inserted into the center of the loaf comes out clean. If desired, continue to brush the loaf with the butter mixture while it bakes for a golden top crust.